The historic Halcyon Mark 49 Goggles have been protecting the precious eyes of pilots and motorcyclists for the better part of a century. Handmade in the UK using only the finest quality materials, the MK49 is finished to the highest possible standard for a premium classic riding experience. 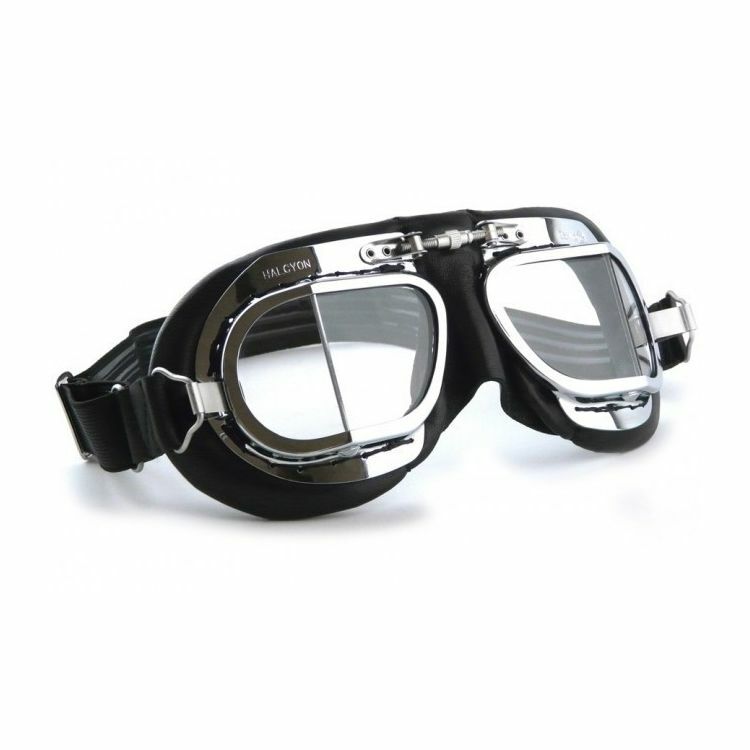 Unlike many other goggles on the market that are mass-produced using molded plastic for the frames, Halcyon MK49 goggle frames continue to be made in brass which is then hand-polished to a mirror finish before being chrome plated. The frames are hand-stitched to a quality padded leather face mask. My husband loves them. He had a pair in Germany. They fit much better under his helmet. Normal biker glasses they were digging in to the side of his head. These have the flat elastic so it's a much pressureless fit. You can wear them on the outside of the helmet too. It's just not as snug a fit on the outside, so the wind can catch in them. Expensive, but Would buy them again if I can't find them cheaper elsewhere. . I would recommend these type of goggles to anyone. Workmanship is wonderful. A must for those super windy days along with the absolutely coldest(-2 at 10:30 AM back home 1AM in the morning at minus one was the real temperature not counting the wind chill cruising speed 80 mph.) I also only wear these at night and on heavy rainy days. My only con is that I wish they came in a light tenet or dark tent on the sunny days when the sun is in your eyes. These goggles are well made in every way. They aren't cheap, but they should last forever. Visibility is excellent and I've had no issues with fogging. Wind protection is excellent as well. The adjustable nosepiece lets you dial them in for a great fit. They band fits perfectly around my summer-wear half helmet. They are comfortable and I forget I have them on, and I do not sweat under them even when riding on 100+ temp days. The only issue I have with these is that the padding is bulky around the goggles, and my helmet won't quite pull down as far on my head as I normally like to wear it without hitting the top of the goggles. These goggles also protrude too far from my face for me to lower the sun visor on my helmet. These aren't issues I can blame on the goggles, but I wish I'd bought a less bulky pair. Bought a pair of these wear with my biltwell helmet. Goggles look great, craftsmanship is top notch from the leather, the lenses, and the metal pieces. Unfortunately, if you plan to ride faster than 30mph, good luck. Air gets into your eyes and it's like riding without any glasses at all. Too bad, they look great. Best goggles I have ever had, in 51 years riding experience. Pricey, but you get what you pay for. Excellent product. Had a pair in the 1960's and it is the same today. The real deal. I love the goggles they look great feel great and the style is amazing super sad I have to return them, but they do not fit fit with my Arai XD4 even with the visor off truly sad.